Instead, I thought I’d just encourage you all to get out there and read as many of Pratchett’s books as you can. They are funny, entertaining, well written and deceptively clever. While many of the themes encountered in his novels are heavy, Pratchett weaves them into the story in such a way that you barely notice them until you find yourself nodding sagely and saying, ‘oh, that’s so true’. If you’re not sure which book to start with, I recommend Truckers which is the first in a trilogy about a race of nomes (not gnomes – they’re statues with red hats and fishing rods) struggling to survive in a world built by and for humans. From there it’s an easy leap to Diggers and Wings and then on to Pratchett’s other work. (Note: I also have a soft spot for Truckers because my mum read it to my brother and I and began my love of Pratchett). 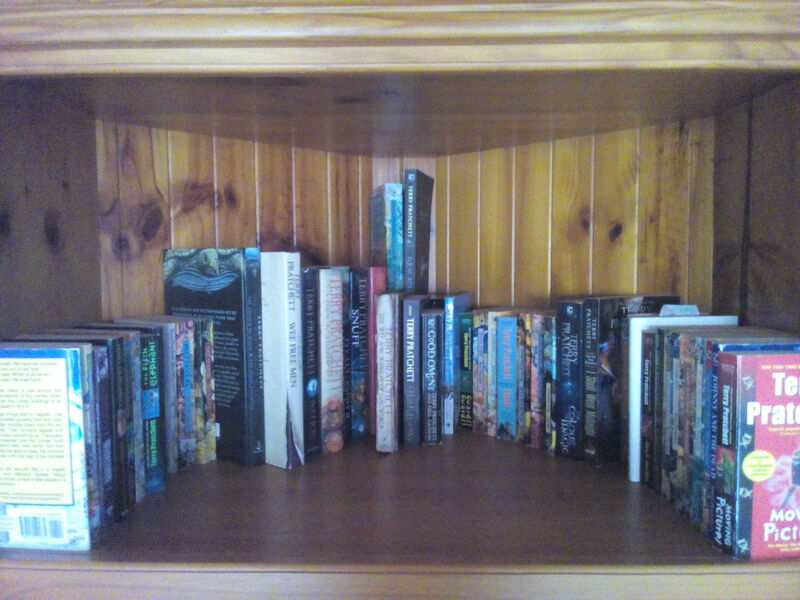 If you’re still unsure how much I love this man’s work, here’s a picture of my Terry Pratchett library. I thought by the looks of some of the books that I was perhaps too old for them. But now that you say that they are interesting I will surely try them out. You should. In your case maybe start with one of the Disc-World novels. They don’t have to be read in any order but there are reoccurring characters. I particularly like the ones about the City Night-Watch…actually that’s a lie. I love them all.